Founded in 1990, Hampstead Garden Opera performs two valuable roles: an opportunity for young singers to participate in staged productions, and to provide opera for north London audiences in a community setting. 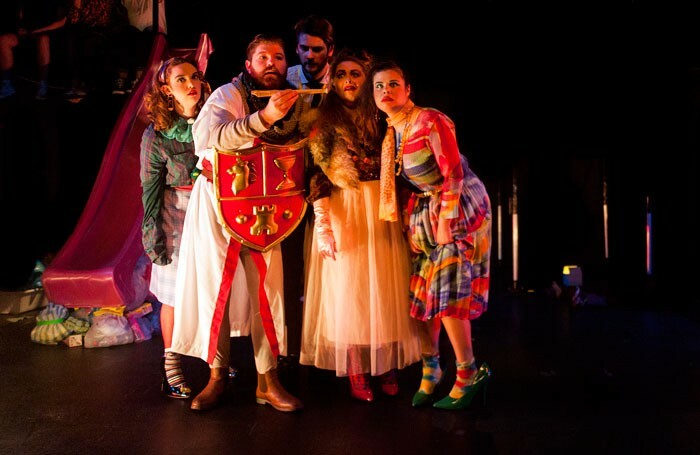 Both are achieved by the company’s latest venture, Mozart’s The Magic Flute, staged in the well-appointed studio space of Jacksons Lane Theatre, Highgate. But its aspiration to offer high quality productions is, unfortunately, less successful. The young cast displays respectable vocal talent (most impressive are the Three Ladies – Rebekah Smith, Caroline Daggett and Stephanie Wake-Edwards), but acting skills need rather more development. In this, the fledgling artists are not helped by Toria Banks’ unfocused, laissez-faire production. The concept has promise – the strange world to which medieval crusader Tamino finds himself transported is a modern-day England run by bewigged judges (Sarastro), tweed-and-gown academics (Speaker) and stern office managers (Queen of the Night) – but the realisation is half-hearted and the action often painfully pedestrian. The strong comic potential in re-imagining bird-catcher Papageno as a gangly office nerd, for example, is wasted with a portrayal so understated as to be mortifyingly awkward – for the wrong reasons. The welcome flash of life when Monastatos and his cronies break into a spell-induced tap routine highlights the general lack of energy and conviction. The score is performed essentially complete, competently conducted – with a 12-piece orchestra – by Christopher Stark; thankfully, much of the spoken dialogue is cut. By amateur or student standards, this is a decent effort. But there is no reason why HGO shouldn’t compete with companies such as PopUp Opera or OperaUpClose, small companies that centre around emerging talent, but which also hold their own in the professional arena.